This thin loop/cavity, seen over the northwest limb of the sun, was recorded by the SMM Coronagraph on July 14, 1984. Solar north is toward the upper left as indicated by the arrow drawn into the occulting disk; the dotted circle marks the solar photosphere. 1. Loop/cavity and partially structured core superposed on streamer. Deflections. Streamer is blown out. 2. Cloud superposed on fan. Ray brightens from 19:03 until 20:37 then fades. Speed (in km/sec): 307 <--- Outer Cavity from Part I. 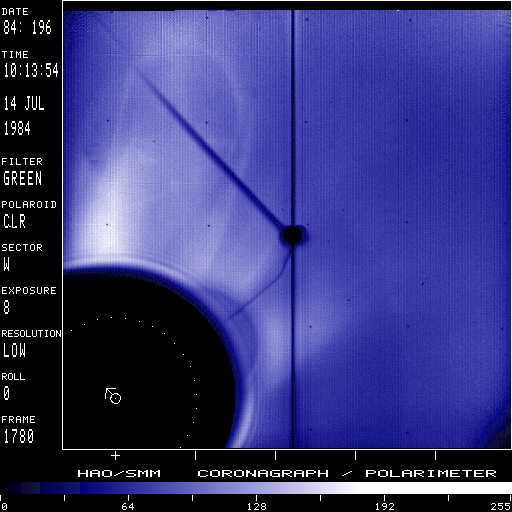 The `streak' seen in the SMM image at 08:34 was caused by space debris moving through the Coronagraph field of view.